Assaf Noy was born in Petah Tikva, Israel in 1977. 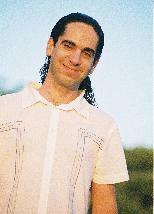 He Graduated "Rimon School of contemporary music" where he studied composition with Dr. Ayal Adler. He also studied composition with Dr. Joseph Bardanashvilli and with Dr. Ari Ben Shabtai, before and during his studies at the "Jerusalem academy of music and dance". His compositions move through different genres, and have been described as: 'works filled with imagination, adventurousness and intensity' and won several awards. Among them included various works for solo instruments, duos, works for chamber choir, works for chamber ensembles and for symphonic and chamber orchestras. These works have been played by some of the top orchestras and musicians in Israel, as well as by the soloists of Bucharst's "George Enescu" philharmonic orchestra and the "Tyrol Austrian ensemble for new music".